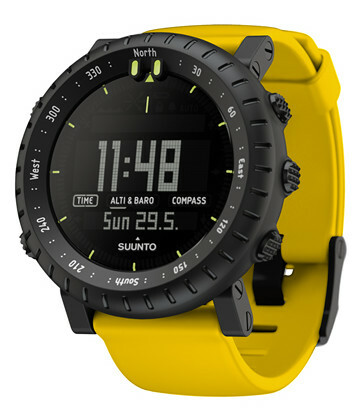 Now I don’t know about you, but somehow that doesn’t fill me with confidence if I was looking to purchase a Suunto Core model at £200 today. In fairness this was from a review in 2010 so hopefully (perhaps) the error is less today? Ever needed to sort out your Citizen ana/digi/temp vintage model – here’s a fabulous web site dedicated to just that very thing. Problems? such as that old auto digital calendar than only goes as far as 2019? Note this will be true for ANY digital perpetual Calendar watch that’s run out of years. Whilst the site refers to the problems and issues of the retro Citizen ana/digi/temp vintage model it includes this neat snippet of information that might be useful to some of you. To solve the date issue – all you have to do is set the watch back 28 years! Only the watch internals know that you’ve changed the current year, as the dial indication normally only gives the Day, Date maybe the Month and the Time – and now for the next 28 years the Days of the Month of your old vintage job will be correct every time. Brilliant! I haven’t tried it myself but thinking on it, as the Month/Day cycle ratio pattern is repeated every 28 years – I should think it’s probably right! Fossil watches – sometimes have not one, but often two and sometimes THREE batteries inside. Now the feature on the watch most likely to die is the EL or back light. So you get in touch with Fossil Service and they say you will have to send it to them etc etc – think of the cost! So you think – OK I can do this and unscrew the watch back and there are 3 batteries looking at you – so which one to change? This is the FS4682 Ana/Digi model illustrated – the sunken Renata 364 cell is for the digital display aspect. The 392 cell (shown bottom here) is for the analog time indication (hands etc) and the 392 battery on the left (as shown left) – this is the EL back light culprit. NOTE – if you look carefully both 392 batteries are covered by an insulating sticky back piece of Mica. 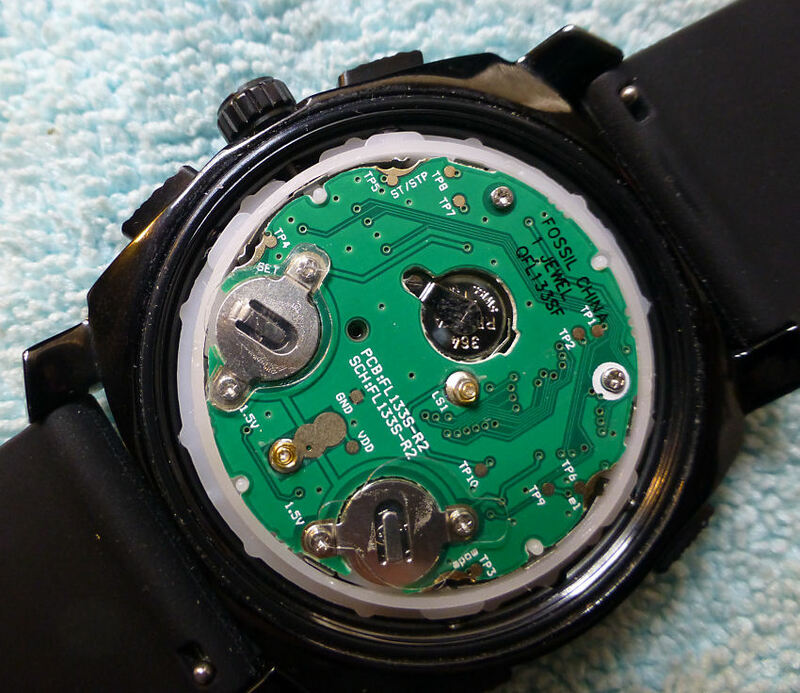 Simply lift it off before removing one of the screws on the battery holder (the other just needs slackening, so you can swing it out of the way), BUT remember to replace the piece of Mica before re-fitting the watch back (you don’t want to short out the circuit board). Usually the movement won’t fall out if you turn it over to see which function stops or starts when you change the battery, but just in case, do it carefully. Job time – around 5 minutes. Cost – £1.95 for the battery. On 10 March 1943, while still a prisoner of war, Corporal Clive James Nutting, one of the organizers of the Great Escape, ordered a stainless steel Rolex Oyster 3525 Chronograph (valued at a current equivalent of £1,200) by mail directly from Hans Wilsdorf in Geneva, intending to pay for it with money he saved working as a shoemaker at the camp. The watch (Rolex watch no. 185983) was delivered to Stalag Luft III on 10 July that year along with a note from Wilsdorf, apologizing for any delay in processing the order and explaining that an English gentleman such as Corporal Nutting “should not even think” about paying for the watch before the end of the war. Wilsdorf is reported to have been impressed with Nutting because, although not an officer, he had ordered the expensive Rolex 3525 Oyster chronograph while most other prisoners ordered the much cheaper Rolex Speed King model which was popular because of its small size. The watch is believed to have been ordered specifically to be used in the Great Escape when, as a chronograph, it could have been used to time patrols of prison guards or time the 76 ill-fated escapees through tunnel ‘Harry’ on 24 March 1944. Eventually, after the war, Nutting was sent an invoice of only £15 for the watch, because of currency export controls in England at the time. The watch and associated correspondence between Wilsdorf and Nutting were sold at auction for £66,000 in May 2007, while at an earlier auction on September 2006 the same watch fetched A$54,000. Nutting served as a consultant for both the 1950 film The Wooden Horse and the 1963 film The Great Escape. Both films were based on actual escapes which took place at Stalag Luft III. It was also reported that in November 2013 the Rolex Speed King owned by Flight Lieutenant Gerald Imeson during the Great Escape was sold for £60,000. It was also true that in 1943 Rolex managed a remarkable marketing campaign by sending letters to all British POW’s offering them a Rolex watch at no cost to themselves until the end of hostilities. Wilsdorf who was of course German himself absolutely believed that the War would come to an end and that Germany would be defeated.